You love traveling with your kids or your grandchildren, but sometimes your interests and theirs just don't jibe. You want to check out a museum or play golf or get a massage, and they want to spend endless hours in the pool, building sand castles or doing whatever it is that kids do. It used to be that either you supervised pool play or castle building, or you dragged them, sometimes kicking and screaming, to the museum. Golf or a massage was out of the question. But now many resorts and vacation destinations offer special programs for kids, including those hard-to-please teens. The kinds of activities vary according to the type of destination, but all have one thing in common: They provide fun and age-appropriate things for children to do while their elders are free to explore their own interests. The programs run the gamut from supervised playtime or movie nights, to classes on being a clown or hip-hop dancing, to programs that teach youngsters to ski or snorkel. Some programs are included with the price of your stay, while others require an additional fee. Of course, before you put children into a program, you need to do a little homework. Find out about the qualifications of the adults in charge. Ask about the adult-to-child ratio. Make sure that there are safety precautions in place and that the program directors can reach you in case of an emergency. Ask a lot of questions about the kinds of activities. Some programs are little more than glorified babysitting services, but others offer a variety of unique and fun activities. However, make sure that the activities are appropriate for the age level and interests of your children. Then, after the first day, ask the kids what they think. Did they have fun? Did they like the other children? Did they like the counselors? Are they looking forward to going again? Usually, you can enroll kids in a program for as many or as few days as you want. Some offer half-day or hourly options, so that you can find an approach that is best for you. Obviously, if you and the children spend all your time apart, it can defeat the purpose of taking a family vacation. But giving everyone the chance to do what he or she wants to do can make the time you spend together even more fun. Theme parks can be a great place to encourage independence, as long as everyone agrees to meet in a specific place at a specific time. Walt Disney World, for example, has several attractions that are especially appealing to teens. Park City Mountain Ski Resort, a popular ski destination in Utah, has a variety of ski and snowboard lessons for kids, ages 3 to 13. Older kids can take regular group lessons. In addition, parents and their kids can take lessons together, with the emphasis on making the ski experience enjoyable for everyone. 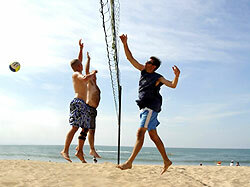 Aspiring Andy Roddicks can work on their serves at Sandestin Golf and Beach Resort in Florida. Junior Tennis Camp, for kids age 5-17, offers daily lessons from kid-friendly pros. Young vacationers also can take golf lessons or learn to sail. Club Med has shed its swinging singles image and morphed into a family-friendly destination. Many locations accommodate kids from 4 months through the teen years with special, age-appropriate activities. For example, kids age 11-18 can join The Juniors Club Med. Activities include sports, such as in-line skating, wakeboarding, circus trapezes and sailing, as well as shows, hikes and group excursions. At Florida’s Amelia Island Plantation Resort, guests from 11 to 19 can participate in the Teen Explorers, enjoying activities like mini golf, bowling, pizza parties, basketball, scavenger hunts and outings.